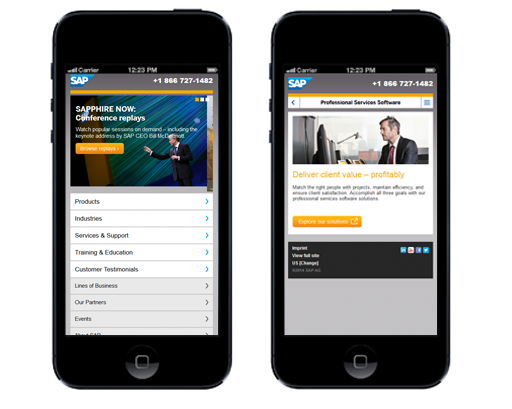 m.sap.com is a best-in-class mobile site with full mobile experience for SAP’s global audience. It acts as a gateway to SAP.com users for accessing the site on their smartphones. It contains only the pertinent content, has simple and clean navigation, and gives an experience that leaves users satisfied. It provides information on SAP Solutions and Services, Product details, Training/Education information and Customer testimonials (Case studies). The site has a Device detection function that detects the browser via user agent sniffing or capability detection, based on the browser user agent information, it will serve up or redirect to the appropriate site. The search is robust and has Predictive typing capabilities. The site is as per the SAP branding standards and aligns with SAP mobility priorities to reflect SAP.com experience.